Glassolutions, European leader for interior glass transformation, provides kitchen designers and manufacturers with a comprehensive and innovative range of glass solutions. The kitchen is a place where we gather among friends and family to share good times. They are constantly changing and increasingly open-plan, defined as modern, structured and personalized living spaces. Glassolutions’ comprehensive range of glass solutions, colors, dimensions, and even materials can be combined as a custom package. Glass is used with other materials to provide a contrasting interplay of colors and textures and make spaces appear larger. The main two trends defining tomorrow’s kitchens are eco-design and innovation. 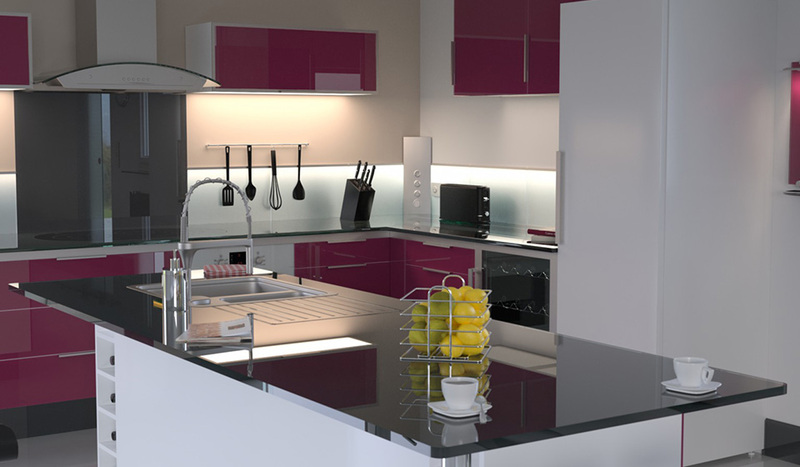 Glassolutions offers a complete range of kitchen solutions. sgg PLANILAQUE/DECOLAQUE lacquered glass can be used for cupboard doors, kitchen units, extractor hoods, sliding doors, counters incorporating cooktop and sink, oven doors with screen-printed designs, FEELING glass tiles, radiators with THERMOVIT glass fronts, and even MAGNETIC GLASS MARKER BOARDS. While lacquered glass is available in 26 standard colors, some products can be custom-built: My Decolaque, or PICTURE IT and My DecoPrint digital printing on glass can be used to personalize the kitchen décor to suit the customer’s preferences. Technological innovations, such as LED lighting incorporated into kitchen units, are also becoming central to kitchen decoration. Lacquered glass solutions structure and personalize spaces, adding light and a sense of increased space. Renowned for their heat resistance and exceptional durability, they are also very easy to clean and hygienic, while also protecting the environment and air quality.